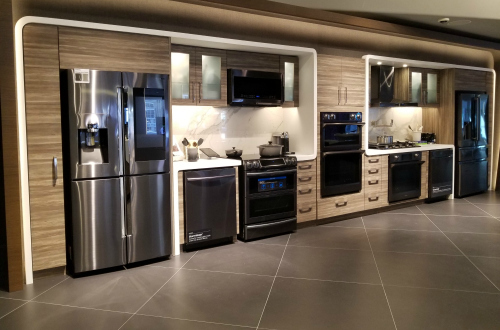 Samsung Electronics Canada (SEC) has opened a 21,000 square foot technology playground in the heart of downtown Toronto, where it places to show off its latest innovations across all its major product categories including major appliances. There are two entrances into the store, one at street level for easy access from the bustling Yonge Dundas Square and the other within the shopping centre itself. At entry, visitors walk into a curvaceous two-storey glass pavilion designed to invite discovery. A metal ribbon flows over the exterior and through the entrance canopy, leading visitors to explore the fluid, contemporary and timeless design. The ground floor features a variety of interactive areas – from an immersive Samsung GearVR virtual reality zone to an interactive Personalization Zone where visitors can add flavour to their mobile device accessories. Nearby sloped counters and service desks display the newest Samsung mobile innovations, from the Galaxy Note8 to a variety of tablets and accessories. Softly lit swirls sweep across walls and ceilings, encircling a grand curvilinear staircase that leads visitors to the second level, where SEC’s television experience zone – featuring The Frame – and a full-scale test kitchen can be found. The kitchen will be extensively used for live cooking demonstrations and classes. Indeed, the space aims to inspire visitors to the store to be curious and features modular design elements and furniture that enable Samsung to host specialised events, including design workshops, cooking classes and speaker presentations. “Our new Samsung Experience Store at CF Toronto Eaton Centre is, simply, unlike anything we’ve ever launched before in Canada. From the moment our guests join us, they will experience the Samsung Galaxy Life connected ecosystem. The dynamic and innovative space will bring our guests closer to the Samsung brand and our latest innovation, enabling them to get closer to what they are passionate about and reach their full potential,” Patricia Heath, SEC vice president of retail excellence said in a press release earlier this year announcing its construction.